Simple and accurate, innovative new technology allows the Kinetik fully automated Advanced Blood Pressure Monitor to take a quick reading whilst the cuff inflates, it then releases quickly once the reading is complete, minimizing pressure on the arm. The Kinetik Advanced Blood Pressure Monitor delivers greater accuracy by taking an average of the last three readings, as recommended by the British Hypertension Society, giving you even greater confidence in your results. Increased sensitivity means the Kinetik Advanced Blood Pressure Monitor will also detect any irregular heartbeat which might give a false reading and highlights the need for seeking medical advice. 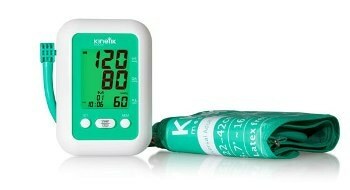 The Fully Automatic Advanced Blood Pressure Monitor’s results have scientific value. This device is compliant with European medical device regulations and is a Class IIa Medical Device. So rest assured you’re buying a quality product.